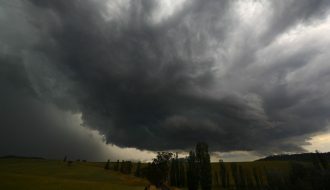 Jeff Brislane and I chased the region west of Mudgee and found ourselves eventually targetting the cell that began its origins south of Wellington! 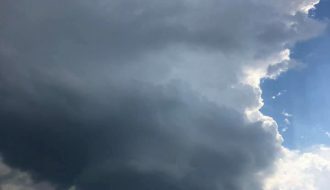 This storm exhibited spectacular structure for some time before gradually becoming slightly elongated. 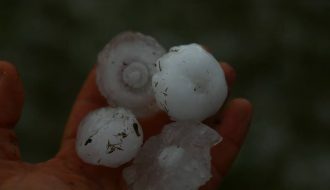 The rain-free base was also consolidated and hail shafts dumped large hail to about 3cm (measured). It was an exciting period but we had no roads and then the storm rapidly went into decline further east. 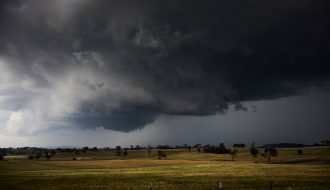 More storms provided hail core observation sessions as well as photographic opportunities. It was a great afternoon. As we headed off from close to an hour on the first cell, we got blasted by 2-3cm hailstones and then headed north. 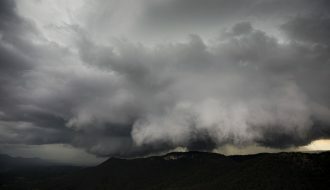 This was the rear view of the storm - moving into regions with no roads. By the time we got into the secondary positon to intercept, this cell had rapidly collapsed - urrr why? Perhaps SE winds moving cooler air. Anyway, we ended up intercepting another cell that had intensified near Wellington and this seems to be going into a split here (the hodographs favoured splits). Very nice and intereting structure evovled and we concentrated our efforts on this cell. Interestingly, cells were continuously developing in the region south and southwest of Wellington mainly. Cells further north struggled - this region (near and south of Wellington) was where lower level shear was more favourable despite the northern area having slightly "higher CAPE". Well done Jimmy! It sounds like you guys had a great chase. I wish I was out there with you! The storm looks nice on the radar, with a definate split! 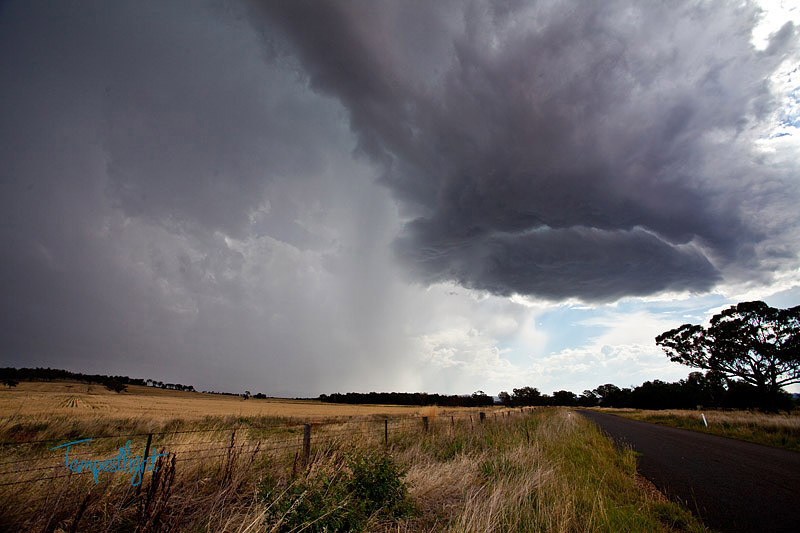 This is near the beginning of the severe phase of the hailstorm Jimmy & I intercepted near Mumbil. It had already split and was now picking up intensity. This is about 5 minutes later when we first got to our vantage point were we watched this beast until it was nearly on top of us! Okay here is the first time-lapse video and this is from my wide angle camera. 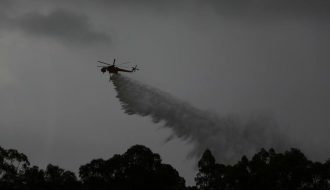 I have not seen radar – (Michael Bath may wish to post it for the day), and there may be a split but if anything the base is not rhowing much signs of rotation. I think the updrafts may well be so who knows. I will post a vidoe eventually. 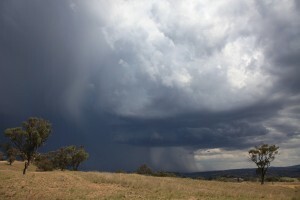 We also witnessed another split near Wellingtton – more from that set of cells later! One feature I did not mention but is evident on the timelapse is what seems like a persistent "beaver tail". I posted more images from this event! 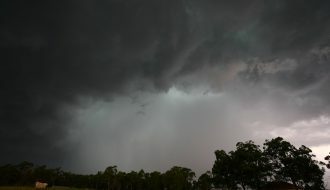 Here is a time-lapse of the first hailstorm from my other video camera showing a more close up view of the base area. Here is a video of our core punch into this hailstorm. The outflow was very intense at times with the odd larger stone hitting the car! Both the 10th and 11th February 2013 events have produced funnels. Interesting znd I wander if the mid-level lapse rates played a part? Both also seem to occur during the weakening period of the storm which is well documented! Here’s Jimmy pointing at the structure. 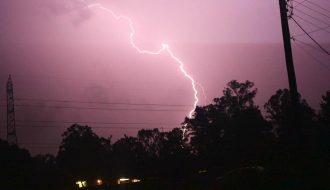 Second storm near wellington. Also a hail producer.